The Villa opened December 2016 and we have had great success and fantastic reviews. Renovations include, a new kitchen, bathroom, decorated throughout and new flooring. When I saw Villa on Castle I was enchanted by its charm and bygone era. The restoration project has been fulfilling and watching the original 1920's villa emerge was exciting. Rimu ceilings throughout and open fireplaces that were oringinal but now for decoration. Central heating will keep you toasty. The coal range is still in place. The lounge overlooks the estuary with a big bay window and seating for those relaxed evenings. There are board games available for your use. Riverton is a gateway to the South where it is only 32km from Invercargill. Riverton itself has some safe swimming beaches and Riverton rocks offers a gentle wave for guests wanting to learn to surf, boogie board or paddleboard. You can drive West and Colac Bay is only 5 min away by car, a popular surf spot by locals and on windy days you can watch the kite surfers. The Colac Bay pub and Pavillion offers meals. Further along the road you can visit Cosy Nook, Monkey Island and Gem Stone Beach at Orepuki. At low tide you can catch mussels. At Orepuki you can see the Fiordland mountain ranges making the view quite spectacular, a visit to cafe a must with homemade baking and quality food. LINEN, TOWELS AND CLEANING IS INCLUDED. Please note for a one night stay a cleaning surcharge of $50 applies. Bookings can be secured with a deposit of the value of the first night's accommodation, within four days of confirmation of availability. Additional guests will incur additional tariffs. Full payment is requested 30 calendar days before arrival date. This payment is non refundable unless the accommodation is re-let for the dates booked. Long stay discounts apply, please enquire. Peak periods/public holidays will be $280 per night for 2 people and weekly bookings. 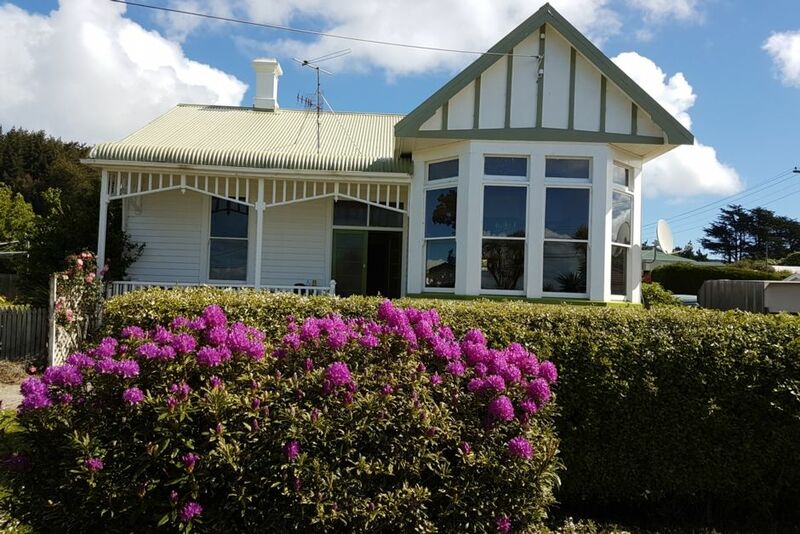 A gateway to the South Coast, surf Colac Bay or Riverton Rocks, stroll along Gem stone beach. Excellent location and well presented. Excellent location and well presented. Would return if in Riverton again. Our party of 4 loved our stay at Villaoncastle – a period house with character, meticulously restored with attention to detail. Riverton is an intriguing town and the surrounding coast is filled with unexpected eye-pleasing delights. Lovely house, very well renovated with period details. Lovely house, very well renovated with period details. The central heating made it nice & cosy on colder nights. The house has everything you need for modern living (eg. kitchen) & close to town & a short drive to beaches. What a lovely place to stay. Comfortable beds and the central heating was wonderful, thanks! The Castle on Villa is a beautiful house, very tastefully done and it retains a lot of the original features, which is lovely to see. Everything you need is supplied. We spent an evening admiring the view across the estuary, sipping a glass of wine - idyllic! Beautiful house! Wish our stay had been longer!